WINTER HAVEN — Legoland Florida Resort is poised to leap across Cypress Gardens Boulevard. Less than a year after opening an onsite LEGOLAND Hotel, Legoland has filed plans for a lakeside resort with 166 single-story duplex units, a pool, two ponds and a 12,000-square-foot clubhouse. Merlin Entertainments Group, corporate owner of Legoland, calls it “Project Oasis” in plans submitted to the Southwest Florida Water Management District for a Statewide Environmental Resource Permit. Merlin filed 15 pages of final construction documents to the district’s Brooksville office Dec. 7. District staff is still reviewing details of the project, a spokeswoman said. The project would be built on 57.7 acres of vacant land adjacent to Lake Dexter behind the Winter Haven Square shopping center, which is across Cypress Gardens Boulevard from the Legoland parking lot. The resort would be Legoland’s first expansion beyond the boundaries of Cypress Gardens, the venerable theme park purchased by Merlin in 2010. The current resort occupies 150 acres entirely on the west side of Cypress Gardens Boulevard. A spokesman for Legoland Florida declined specific comment on the project. Merlin Entertainments purchased the property Monday from John G. Wood and Associates, paying $4.6 million, according to a deed filed with the Polk County Clerk of Courts. The company is owned by state Rep. John Wood, R-Winter Haven. Wood’s family has owned the property since 1969, according to Polk County Property Appraiser records. Reached by phone in Tallahassee, where the Florida Legislature is in session, Wood declined to talk in detail about the transaction. “I can confirm that is a valid deed,” Wood said. The property, currently a grassy expanse on the western shore of Lake Dexter, is bordered by Register Road, which extends east from Legoland’s main entrance and splits into a north-south road running behind Winter Haven Square. The shopping center includes a Publix Super Market at 6031 Cypress Gardens Blvd. Engineering sketches filed with SWFWMD depict a resort with circular and semi-circular clusters of up to eight structures. The 83 duplexes would offer 166 units for guests. The permit application covers only engineering plans and doesn’t offer any details on the capacity of the duplex units, prices for lodging or the length of stays that would be available. It’s not clear how soon construction might begin or when the resort could open for guests. Mark Jackson, director of Polk County Tourism and Sports Marketing, said the project shows the long-term confidence Merlin and Legoland leaders have in the area. The plans filed with the district lists the engineering contractors as Littlejohn Engineering Associates of Orlando and TLC Engineering for Architecture of Cocoa. The architect is Wallis Murphey Boyington of Lakeland. Benjamin Ellis, senior project manager for Littlejohn, wrote to SWFWMD in a letter dated Jan. 25 to respond to 16 comments about the project’s site development plans. The first comment noted a discrepancy between the permit applicant, Merlin Entertainments Group Florida, and the owner the property, John G. Wood and Associates. That issue was settled with the sale of the property this week. In his response to the comments, Ellis said the project will have no impact on wetlands. In its comments, SWFWMD said it is coordinating with the Florida Fish and Wildlife Conservation Commission’s Bureau of Imperiled Species on possible secondary impacts to threatened or endangered species. A small canal separates the property from houses on lakeside lots to the north on Register Road SE. Orlando Fonte lives in the second house north of the property where Legoland proposes to build Project Oasis. Fonte said local residents have been hearing rumors about a Legoland development at the site for a long time. Fonte said he knows Wood and asked him about plans for the property as recently as two months ago. He said Wood gave an evasive response. Fonte said his main concern would be an increase in boat traffic on Lake Dexter, which borders his backyard. He said he has a dock on the lake and owns a boat. The design sketches in the application to SWFWMD do not indicate plans to build docks and don’t mention plans for use of the lake. Aside from that one concern, Fonte said he welcomes the expansion. “I hear (activities at) Legoland all day while we’re outside, but that doesn’t bother me at all,” Fonte said. Legoland Florida opened in October 2011 as the second such attraction in the United States. The attraction, aimed at families with children ages 2 through 12, has expanded with several new rides and themed areas since then. 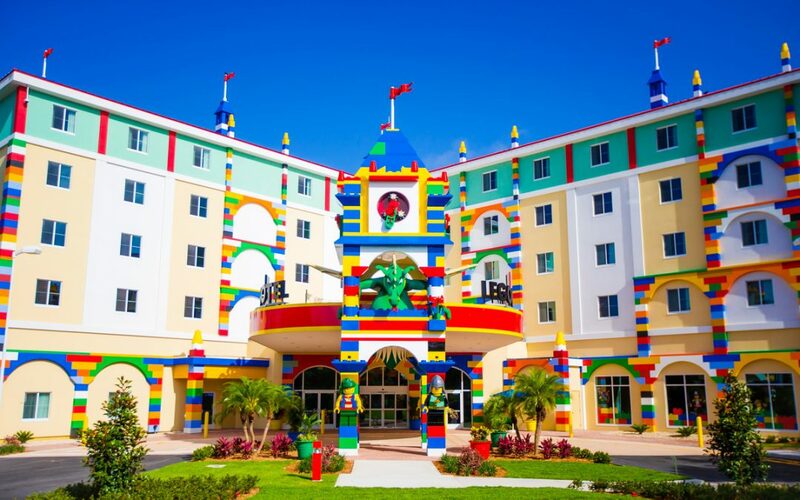 Last May, the theme park opened Legoland Hotel, a five-story, 152-room lodging with rooms catering to children in four designs reflecting sections of the park or Lego products. Brady, the Legoland spokesman, said the hotel has been a success. Jackson said the resort will further spur tourists to make multiple-day stays in Polk County. “From a tourism and sports perspective, it just provides us with additional inventory and that inventory is going to foster even more growth in the outlying areas, so we certainly have been blessed,” Jackson said. 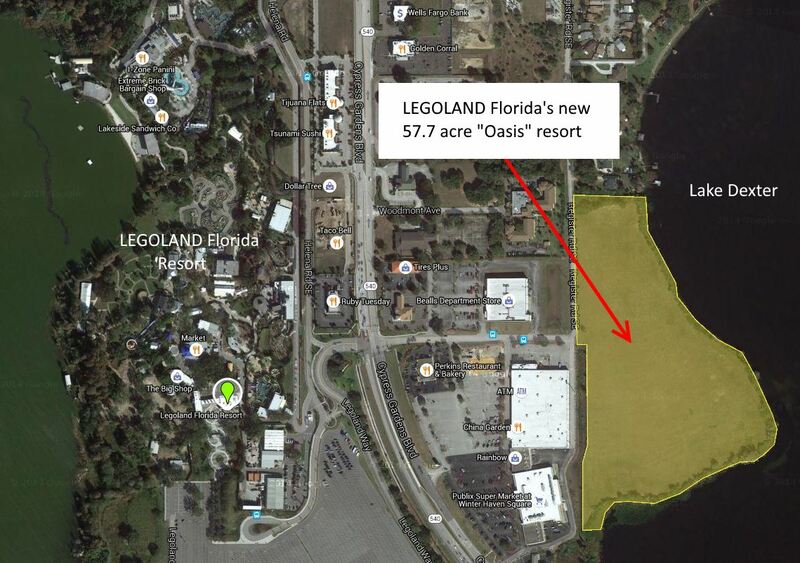 Let me hear your comments on the new LEGOLAND Florida “Oasis Resort” in the forums or comments below.